The recent increase in the demand for portable communication devices, such as smartphones, memory cards, smart card, and various computing devices has boosted the global market for thin wafer processing and dicing equipment substantially. In 2015, the global market for thin wafer processing and dicing equipment garnered US$388.9 mn in revenues, which, with an expected CAGR of 6.80% between 2016 and 2024, is likely to increase to US$692.5 mn by the end of 2024. The rising awareness about the attributes and benefits of thin wafer processing and dicing equipment, such as better electrical performance and reduced production cost of the device, is likely to support the growth of this market significantly over the next few years. Blade dicing, plasma dicing, and laser dicing are the three main dicing technologies utilized in wafer processing and dicing equipment. Among these, blade dicing, which is traditional dicing technology, has acquired the leading the global market and is predicted to remain dominant over the period of the forecast. Laser dicing technology, however, is likely to prove to be more lucrative for manufacturers in the near future due to low operating cost and kerf loss, leading to an increased production of chips. Various attributes, such as high-speed dicing and superior breakage strength is also projected to add to the popularity of laser dicing, reflecting greatly on its demand over the next few years. 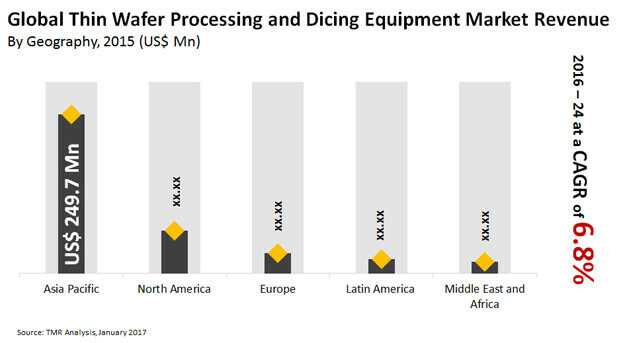 North America, the Middle East and Africa, Europe, Latin America, Asia Pacific are the key regional markets for thin wafer processing and dicing equipment. Asia Pacific dominated the global market with a share of 64.2% in 2015 and is anticipated to remain leading over the forthcoming years, thanks to the increasing uptake of thin wafer processing and dicing equipment in small consumer electronics devices, specifically in mobile phones, and several other devices used for communication and computing. Along with this, the growing usage of these instruments in semiconductors is also projected to boost this regional market in the years to come. China, Taiwan, and Japan have emerged as the main domestic markets for thin wafer and dicing equipment in this region on account of providing lucrative opportunities to the manufacturers of thin wafer processing and dicing equipment. North America, which held the second position in 2015, is also expected to witness a healthy rise in the valuation of its market by the end of 2024. The swift technological advancements in consumer electronic devices, in a bid to develop state-of-art smart home devices and wearables, are anticipated to fuel the demand for small integrated circuits, which in turn, is expected to influence the uptake of thin wafers, consequently, boosting the demand for thin wafer processing and dicing equipment over the forthcoming years. EV Group, Lam Research Corp, Plasma-Therm LLC, DISCO Corp., Tokyo Electron Ltd., Advanced Dicing Technologies, Suzhou Delphi Laser Co. Ltd., SPTS Technologies Ltd., Tokyo Seimitsu Co. Ltd., and Panasonic Corp. are some of the leading producers of thin wafer processing and dicing equipment across the world. Rising demand for three dimensional integrated circuit used extensively across various miniature semiconductor devices is one of the important factor anticipated to boost the demand for thin wafer processing and dicing equipment in the coming years. Three dimensional integrated circuit are increasingly adopted across various space constrained applications including portable consumer electronic devices, sensors, MEMS and industrial products as it increases the overall performance of the products in terms of speed, durability, low power consumption, light weight and memory. Moreover, three dimensional integrated circuit also helps to reduce the area of consumption in a printed circuit board and in turn enables extensive cost reduction. Thin wafer of thickness 20 um – 50 um is an integral part of the three dimensional integrated circuit technology. Thus, anticipated increasing demand for three dimensional integrated circuit in turn is predicted to boost the demand for thin wafer processing equipment during the forecast period from 2016 to 2024. For the purpose of providing an exhaustive analysis of the thin wafer processing and dicing equipment market across the globe, the market has been segmented on the basis of application, dicing technology, wafer size and geography. Thin wafer finds are used extensively across various application sectors including logic and memory, MEMS (Micro Electro Mechanical Systems), power device, RFID (Radio Frequency Identification) and CMOS image sensor. Moreover, different technology used in the process of dicing thin wafer including blade dicing, laser dicing and plasma dicing is also covered within our scope of research. Different laser dicing procedure such as laser ablation and stealth dicing has also been considered to track the market estimate of laser dicing technology. In addition, different application and dicing technology segment has been further classified on the basis of wafer thickness such as 750 μm, 120 μm and 50 μm. Furthermore, information relating to the current market trend and future expected market growth of the application, technology and wafer thickness segment across different regions including Asia Pacific, North America, Europe, Middle-East and Africa (MEA) and Latin America is also provided within the report. The report provides assessment of different drivers that is impacting the global market, along with the restraints and opportunities that are anticipated to affect the demand of thin wafer processing and dicing equipment in the coming years. For each segment (such as application, dicing technology and wafer size), market dynamics analysis has also been provided in this report. All these factors helps in determining different trends that has been impacting the overall market growth. Moreover, after taking into consideration all this factors, an extensive analysis of the region wise growth parameters of thin wafer processing and dicing equipment market along with the overall assessment during the forecast period of 2016-2024 has been also been furnished within this report. Furthermore, the report includes porter’s five forces analysis in order to understand the level of competition exist within the industry. Moreover, various wafer thinning and packaging constraints coupled with advanced packaging trend that are anticipated to affect the demand of the thin wafer processing and dicing equipment is also covered within our scope of research. The market attractiveness analysis in respect of application, dicing technology, wafer thickness and geography is also provided in this report in order to provide deep insight regarding the market. The major players in the thin wafer processing and dicing equipment market have been profiled competitively across the different broad geographical regions. In addition, the report also provides competitive analysis of the market players in which the leading strategies adopted by the key players to maintain their leading position in the market and the market share of the leading players in terms of percentage has also been highlighted in this report. Some of the major players operating the thin wafer processing and dicing equipment market includes Disco Corporation (Japan), Plasma Therm LLC (USA), Tokyo Electron Ltd (Japan)and EV Group (Austria)among others.